I made this card to send to a 4 y.o. boy with Leukemia. Just a little bit of encouragment. 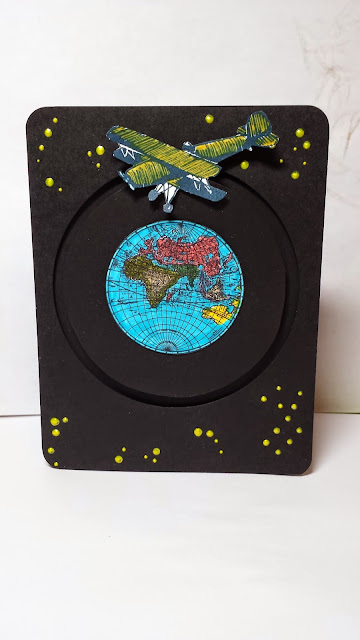 The face of the card represents the sky and the globe with a plane flying overhead. The plane is on a button and rides in a trough between the center circle and the frame. The plane can fly in a complete circle around the globe. On the inside of the card I used a piece of bright yellow cs to keep it light and cheerful. The sentiment reads "Hope is a place somewhere between takeoff and landing." "I hope today you are having a terrific day!" Do something KIND for someone today! 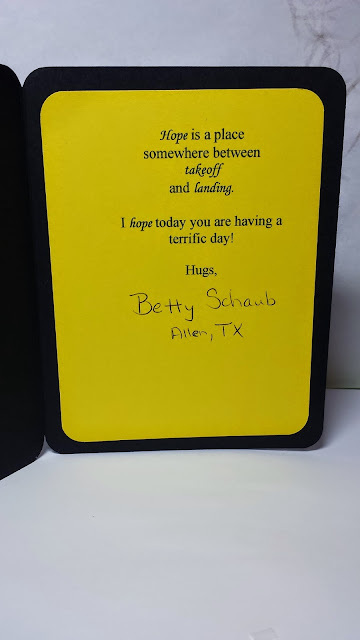 so adorable and so thoughful of you Betty..